Probably one of our youngest Musical Directors. He has been our musical director for around 5 years now. More recently he was on "Take the Floor" with his own Band for BBC Radio Scotland. Amusingly he shares a birthday with the deputy Musical director, who is 18 years his Senior. I have been playing the accordion since the age of 6, and a fact little known by some members of DSRS is that I played the fiddle from about the age of 8 - 18. (Unfortunately my fiddle has not seen the light of day for over 20 years). I passed Grade 5 Violin and Grade 8 Music Theory, and an "O" grade in Music. I have been a member of the DSRS since I was 13 - (not that many years then) . I have travelled to both London and Germany with DSRS, and have also been a member of the 2 incarnations of the Dundee Accordion Band during the 1980's and more recently in the 2000's. Ian started violin lessons at the age of 8 in 1941, taught by Mrs Jean Galloway who used a room in a friend's house, Miss Kate Valentine, in Tofthill, for Lochee pupils as she lived at Fairmuir. Lessons continued either at Tofthill or Elgin St, eventually getting big and brave Ian must have been at least 10 by now said "I do not like your choice of music; I want to play Scottish music" Eventually she conceded either change the tune or lose the pupil! Next lesson she produced Skinners Scottish Violinist, Ian had won! Lessons continued with perhaps two strathspeys or a reel every week repeated if necessary. Ian still has that particular book to this day with the teacher's comments and instructions! Of course this was during the War, the printed price was a shilling but it cost Ian one and sixpence as the book was out of print. It was suggested by a friend, that he try the Woodlands Hotel, and the Dundee Strathspey & Reel Society which must have been around 1980, and here we are 35 years later and Ian is still a regular attendee. 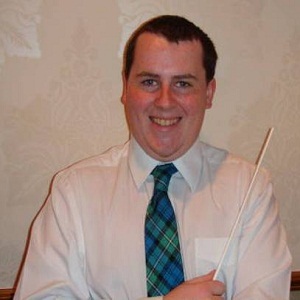 Ian was appointed leader of the orchestra during the 2014/15 season.